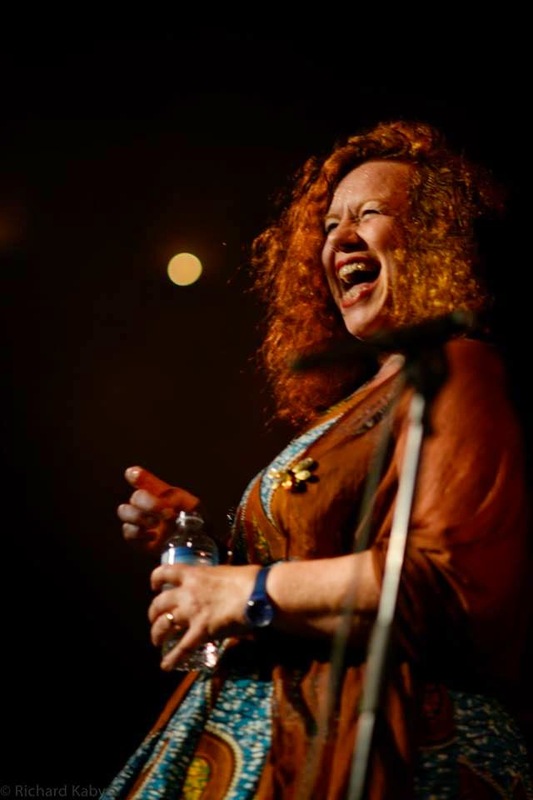 This was the third time I’d heard Sarah Jane Morris over the last four decades. Back in the 80s, I saw her fronting The Communards with Jimmy Somerville at Rock City in Nottingham. By the time I saw her next, in the intimate setting of the Pigalle Club on Piccadilly. she’d embarked on her solo song-writing career. On Saturday night, here she was singing some great new songs with a highly political edge in the most unlikely setting of a West End casino. For her most recent album, Bloody Rain (Fallen Angel, 2014), Morris assembled a talented crew to create a gorgeous African setting for her soulful bluesy contralto. The album was a PledgeMusic project and is a celebration of humanity, dedicated in fact to the people of Africa, and was recorded in the UK, Johannesburg, Paris and Tel Aviv. Many of the artists on the album were appearing on the gig: Henry Thomas sounding great on electric bass guitar, the wondrous Brazilian percussionist Adriano Adewale, Martyn Barker on drums, John Eacott on trumpet and flugelhorn, Tim Cansfield, and Tony Remy on guitar, with whom she co-wrote much of the material. She also added a small choir drawn from the Soweto Gospel Choir to the mix. Resplendent in a fabulous black floral print crinoline, Morris delivered her riveting lyrics and melodies with tremendous warmth and conviction, starting with Feel the Love, and closely following the track order on the album itself. No Beyonce is a heart-rending tale of a young girl, the title track itself Bloody Rain a powerful indictment of the harsh conditions many Africans endure, and Deeper Well, a searching lament. The guitar-driven arrangements with thoughtful percussive overlays and choral backings together with some beautiful solos from Eacott and Thomas were evidence that this band really knows what it’s doing and works well as a collective unit. There is texture as well as meaning to all her songs, the dirt, pain and hurt keenly felt and deeply ingrained, Coal Train being no exception, with its evocative list of place names and a heart-stopping primal scream. Perhaps wondering if by this stage in the set she might have tipped the balance too far in terms of the politics of human struggle, Morris lifted the mood with the song she wrote for Annie Lennox’s Sing campaign raising money for women and children with HIV/Aids, entitled Men Just Want to Have Fun, a cheeky calypso-esque Aretha-like rant about the necessity of using condoms garnished with plenty of amusing innuendo. But Morris wanted us to have even more fun than that, and finished the set by getting us all up singing and dancing to I Shall Be Released (by Keziah Jones), Piece of My Heart, and last but not least, a lovely version of Don't Leave Me This Way, which she managed to prevent from becoming a nostalgia-fest by singing it as though it was a brand new song. Sweaty, breathless and beaming from ear to ear, Morris declared after rapturous applause that they would do an encore ‘without first leaving the stage, if that’s OK’. And yes, we were more than happy with that.